Genuine hospitality and unexpected amenities - that is why were voted the Best Hotel in Marshfield, Wisconsin! Hotel Marshfield, BW Premier Collection is an entirely renovated hotel featuring modern accommodations, unexpected guest amenities, spacious meeting & event space and warm, Midwestern service. 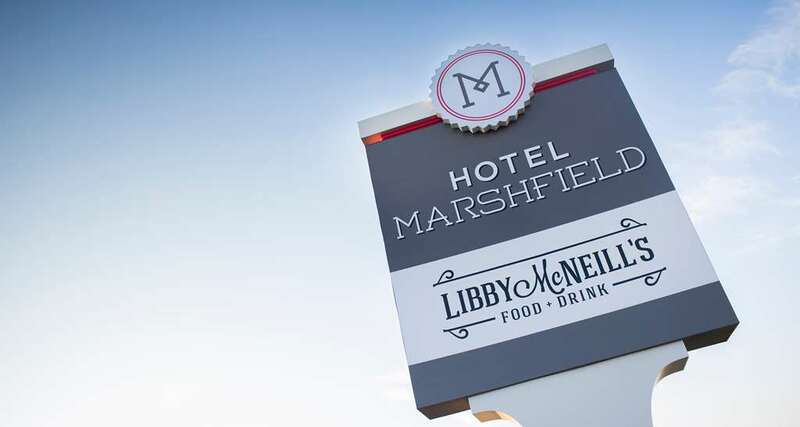 We are Marshfields newest full-service hotel and ideal for business travelers. We are located only minutes from the Marshfield Clinic, St. Josephs Hospital, Roehl Transport and several other local businesses. Our hotel is pet-friendly and offers amenities including free Wi-Fi, local shuttle service and a complimentary full hot breakfast at our on-site restaurant, Libby McNeills. From: Marshfield Clinic. Head south on Central Avenue about 2 miles. The Hotel Marshfield, BW Premier Collection is just ahead. From: Saint Joseph's Hospital. Head south on Central Avenue about 2 miles. The Hotel Marshfield, BW Premier Collection is just ahead. Bird watching - 10.4 mile(s) from McMillan Marsh Wildlife, you'll find this wildlife area just north of Marshfield. We like it for its varied opportunities for cross-country skiing, snowmobiling, bird watching, nature walks, and jogging. Sauna - Outdoor courtyard featuring lounge seating and seasonal outdoor pool. Also outdoors is a hot tub, cool down tub and large sauna which are open all year long. 3.1 mile(s) from Target, home goods, clothing, electronics and more. Starbucks located inside this store. 2.8 mile(s) from Figi's Outlet Store, many call Figi's "Marshfield's best kept secret". This store is full of gourmet foods including favorites from the Figi's catalog, plus decor and gifts all at bargain prices. 3.5 mile(s) from Walmart , conveniently open 24 hours a day. 2.7 mile(s) from Marshfield Mall, offers a variety of stores such as JCPenney, GNC, Younkers, and Kohls. 1.7 mile(s) from Weber's Farm Store, three generations work together at Nasonville Dairy to supply customers with delicious, fresh Wisconsin cheeses, including cheese curds made daily. 1.6 mile(s) from Main Street Marshfield, located in the center of downtown Marshfield, you can find antiques, books, clothing, crafts, restaurants and salons. Spend an entire afternoon exploring downtown! 3.3 mile(s) from Jo-Ann Fabrics, largest assortment of fabric, sewing, quilting, scrapbooking, knitting and other crafts under one roof. 2.8 mile(s) from Shopko, from baby gear to toys, clothes and home they've got the quality brands and value you trust. 1.7 mile(s) from Roehl Transport Inc.
2.9 mile(s) from Staab Construction Corp.
21.1 mile(s) from Kelley Supply, Inc.
2.5 mile(s) from Felker Brothers Corp.
2 block(s) from Wildwood Park and Zoo, right next door to Hotel Marshfield, plus admission is free, so this is an easy must-see. Fox, bison, timber wolves, prairie dogs and white-tail deer are just a few of the North American species here. Where big fiberglass statues come from, and where you can always wander the Mold Field and see the latest creations. A tall fiberglass statue for the Bicycling Capital of America. Manufactured nearby at FAST Corp, "Ben Bikin'" is 32-ft. tall.